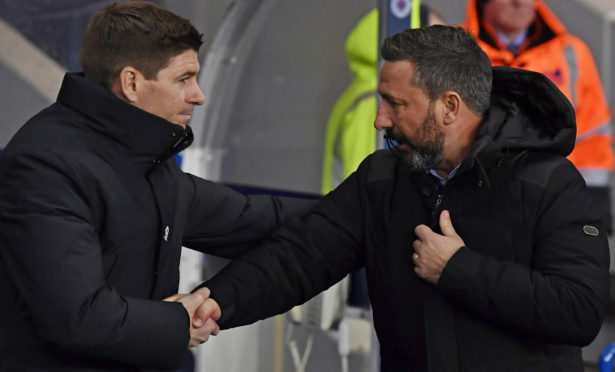 Steven Gerrard, right, shakes hands with Aberdeen boss Derek McInnes on Tuesday night. Rangers’ 2-0 defeat in their Scottish Cup quarter-final replay against Aberdeen at Ibrox on Tuesday night all but guaranteed there will be no silverware for Steven Gerrard’s side this season. I thought in all honestly that Aberdeen had blown their chance when they didn’t beat them at Pittodrie. On Tuesday, the Dons were also without striker Sam Cosgrove and the dangerous Gary Mackay-Steven so credit to Derek McInnes and Tony Docherty for the win. It gives them a right good boost going into the last part of the season and I can see them really kicking on. They now have something juicy to play for. The only down side for Aberdeen was the yellow card picked up by Andrew Shinnie which will rule him out of the semi-final. It seems harsh that someone should be banned for picking up two bookings when Aberdeen have been involved in replays in the cup and it’s something that needs to be looked at. It is a shame for Shinnie and I really feel for him. As for Rangers, it was obviously a bitterly-disappointing result for them and with Celtic eight points clear at the top of the Premiership it seems certain the Ibrox side only have pride left to play for this season. The game against Aberdeen in the cup was their last chance of picking up a trophy so to be turned over 2-0 at home will not have gone down well with the club’s fans. Gerrard’s team does seem stronger this season but if you are one of the top clubs in Scotland, then you have to win trophies. After all the hype over his initial appointment, it has been a bit mixed so far for the Liverpool legend and this has probably been his learning season. He certainly had enough match experience as a player but he is still learning the ropes as a manager both on and off the pitch. But the pressure will really be on him next year in all honesty. The one thing Celtic have had in recent years has been a level of consistency but Rangers are still too up and down. Considering the Hoops lost Moussa Dembele in August and have been without the likes of Leigh Griffiths, Tom Rogic, Nir Biton and Kieran Tierney for a lot of the season – as well as the departure of manager Brendan Rodgers – Rangers should be pushing them harder in the Premiership. Alex McLeish with Allan McGregor. Speaking of Rangers . 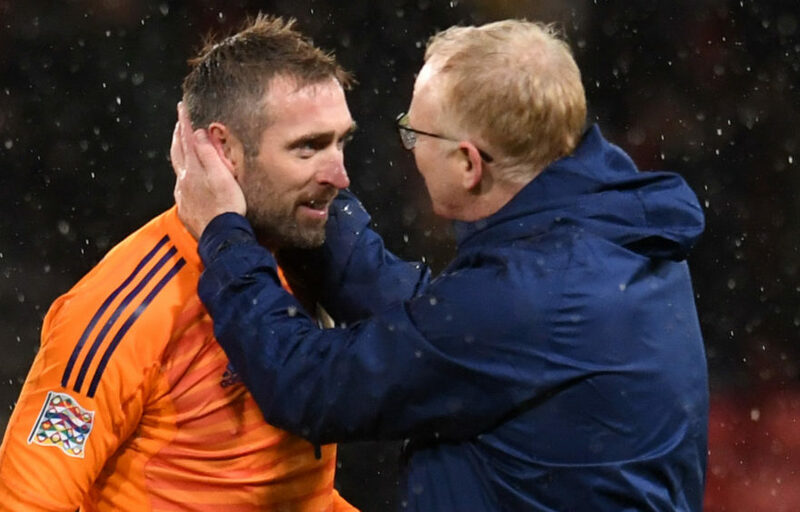 . . there were a few eyebrows raised when keeper Allan McGregor announced his international retirement just before the latest Scotland squad was released. National boss Alex McLeish admits he was shocked when he received the call from the 37-year-old Ibrox goalie as he thought he was set to continue with Scotland until he was in his 40s. We are not privy to the ins and outs but maybe Greegsy is more susceptible to wee, niggling injuries the older he gets. The timing could have been better but at the end of the day he is probably wanting to prolong his career and I can understand that. Greegsy will be determined to train as hard as ever and he has been great for Rangers this season. He is maybe looking at the long-term picture and when there are internationals, he can get a break and some recovery time instead of being away and doing singles and doubles with the Scotland squad. He has had a great career with his country – admittedly with a couple of controversial moments – but we have to respect his decision. We now move on and a big coup for me would be if we could get Angus Gunn to opt to play for Scotland instead of England. I know he is young but the Southampton keeper has everything about him. But from the squad that has been selected, Celtic’s Scott Bain has to be in pole position. It doesn’t seem that long ago he was in the freezer at Dundee which just shows you what can happen in football. He has proved a few people wrong with a lot of cleans sheets for Celtic so good luck to him. I have to admit I am surprised St Johnstone have now lost eight games out of the last nine they have played. However, I think when you look at the bigger picture, St Johnstone have played Celtic three times and Rangers once in that run. I am sure they will return to winning ways soon – hopefully by doing Dundee a favour by beating St Mirren on Saturday – as Tommy Wright is a great manager. At Arbroath, we have also had a couple of defeats and we have to hold our hands up and say we were very disappointing at home last Saturday against Stenhousemuir. I’m sure the boys can’t wait to get back at it against East Fife this weekend and hopefully get a result.